At times during this year's World Championship, Ronnie O'Sullivan sounded like a man who had experienced a great awakening. There was more to the game of snooker, he now realised, than frolicking when the sun shone. In the final, Mark Selby introduced O'Sullivan to a state of full enlightenment: some of the finest snooker is played in what appear to be the grimmest of circumstances. Having engaged in an epic semi-final against Neil Robertson, which he won 17-15, a jaded 'Jester from Leicester' spent most of Sunday looking like he had spent the previous night trying, in vain, to locate his misplaced bells. When Selby found himself 8-3 and 10-5 behind, he seemed almost dead and buried. And so began the tortuous, some might say torturous, process of escape. In tunnelling his way back to 10-7 after the first day's play, Selby managed a highest break of 62. It was not the game as some fans like it to be played. Critics on Twitter labelled it "anti-snooker". But just as styles make fights in boxing, styles make matches on the baize. Selby tied O'Sullivan up, got in his face, prevented him from getting his shots off. Why would Selby play it any other way? Certainly O'Sullivan saw it coming and appreciated it when it came. "He's a modern-day Cliff Thorburn," said O'Sullivan, having lost 13 of the last 17 frames to lose the final 18-14. "If you start missing balls against Mark, he'll keep putting you in trouble and it can become quite difficult. I felt quite numb." Thorburn, the Canadian who won the world title in 1980, was known as 'The Grinder'. Before this year's final, O'Sullivan labelled Selby 'The Torturer'. Not everyone has the talent to be a 'Rocket', a 'Hurricane' or a 'Whirlwind'. During Monday's first session, the venue for the final was less a crucible than a quarry. O'Sullivan, who apparently ran out of dynamite at some point on Sunday evening, found himself scrabbling with Selby, desperately trying to dig out frames. But when O'Sullivan went numb, Selby began to bristle. One moment spoke volumes. 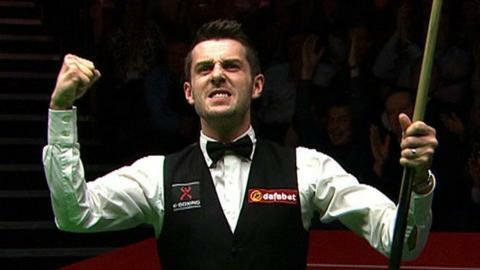 In frame 25, with the score locked at 12-12, Selby laid a snooker behind the brown before leaking a wee, impish smile. Selby was a man embracing adversity. Over in his corner, O'Sullivan mopped his brow. "To get out of Sunday 10-7 behind, it felt like I was 10-7 ahead," said Selby, having clinched his first world title and prevented O'Sullivan winning his third in a row. "Whenever he missed, I kept digging in and winning frames." That Selby found a way of stemming O'Sullivan's natural, free-flowing game should be applauded. Selby's was matchplay snooker at its brutal best. Not pretty, but snooker at the highest level has never been a potting contest. This year's final was also far more compelling fare than the previous two editions, both of which O'Sullivan won with plenty to spare. O'Sullivan processions are fun, but they do not reflect well on the overall health of snooker. This was especially true when O'Sullivan lacked commitment to the game. Every sport benefits from at least one other-worldly talent, doing things nobody else can do. But for a sport to stay fresh, that other-worldly talent needs to be harried and shot at by a voracious chasing posse, desperate to bring them down. Ding Junhui, who lost his world number one spot to Selby following the Leicester man's Crucible triumph, fell at the first hurdle this year. But the Chinese player, who won five ranking events this season, will come again. Add Neil Robertson, who made a mind-boggling 103 centuries this season and won two ranking titles, into the mix, as well as a resurgent Judd Trump, narrowly beaten by Robertson in the Crucible quarter-finals, and you have an exciting set of rivalries at the business end. And as anyone who has followed men's tennis in recent years will tell you, rivalries are what make a sport. Selby, 30, dedicated his victory to his father, who died two months before he turned pro at the age of 16. But almost as heart-warming as Selby's triumph was O'Sullivan's acceptance of failure and graciousness in defeat. There was a time, not too long ago, when O'Sullivan might have viewed his defeat by Selby as a personal disaster. He might have grumbled about the state of his game, the state of his mind, the state of pretty much everything. But since linking up with sports psychiatrist Steve Peters in 2011, O'Sullivan seems to have found peace and perspective, at least around a snooker table. "I tried my hardest but he was just too good," said the 38-year-old O'Sullivan, a five-time world champion. "If you sign up to be a top snooker player, you accept the losses with the wins - you can't have it all your own way. "Three years ago I wasn't even contemplating playing, let alone equalling Steve Davis's six world titles or Stephen Hendry's seven. So I'm very content. I've had a good tournament and I'm proud of my performance." O'Sullivan's story is one of the most inspirational in sport. It is a lesson to anyone who is struck down with crippling perfectionism, lack of motivation, fear of failure or self-doubt, that by reaching out for help you can achieve mental equilibrium and make yourself a better performer and person. Having reached out for help, O'Sullivan has transformed himself from someone many thought would fade from the game having failed to fulfil a lavish talent into a marvel of longevity. Twenty-two years at the Crucible and still showing the kids how it's done - who would bet against another decade? Meanwhile, a few of his old rivals should perhaps be thankful his journey to enlightenment took this long.